1 Put the chickpeas, onions, toasted bread, parsley, baking powder, flour, and garlic through a meat grinder then mix together in a bowl with the finely-chopped coriander, cumin, salt (if you are so inclined) and pepper to taste. 2 Slice the eggplant, add salt and fry it in a pan until it softens. Pinch one of the fried slices for yourself while no-one is looking, eat it quickly and try not to burn your mouth. 3 Mix Hellmann's mayonnaise with the Harissa paste in a small bowl for a spicy taste of Morocco. 4 Shape the falafel mixture into patties and slowly fry them in margarine or oil. 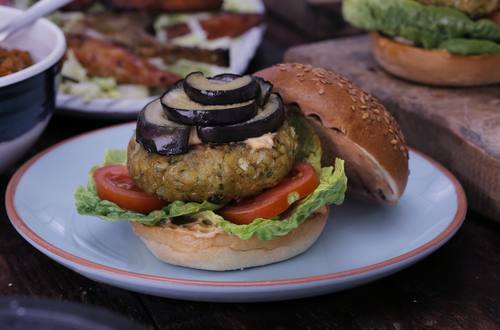 5 Spread the buns with Hellmann's mayonnaise, add the falafel, the slices of eggplant, tomatoes and mayonnaise.